Zack and Amp get a serious surprise in the fifth installment of this intergalactic chapter book series by Nate Ball, the host of PBS's Design Squad and Design Squad Nation. Zack and his alien friend, Amp, discover that leverage can be an Earth-saving thing when they build a rocket-launching atlatl! Nate Ball is the host of the Emmy and Peabody award-winning PBS reality shows Design Squad and Design Squad Nation. An MIT graduate with a master’s in mechanical engineering, Nate is also the cofounder of Atlas Devices, a two-time All-American pole-vaulter, and a competitive beatboxer. He lives with his wife in Cambridge, Massachusetts. 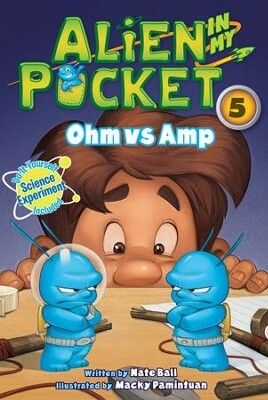 I'm the author/artist and I want to review Alien in My Pocket #5: Ohm vs. Amp - eBook.